Two candidates entered. And... both of them left without anything really changing. Wednesday night, during NBC's Commander-in-Chief Forum, Matt Lauer had half an hour with each presidential candidate. The forum offered a great opportunity to ask Hillary Clinton and Donald Trump questions about national security and discuss their preparedness for the job of president. However, by the end of it, the main thing we learned was that Lauer was not prepared to interview Trump or Clinton. Granted, Lauer had a difficult, perhaps impossible task. He had under 30 minutes to cover the wide-ranging topics of national security, the military, and veterans. He had two candidates who squirmed their ways out of tough questions — Trump spent much of the forum bloviating as usual, while Clinton played hard defense. Lauer tried his hardest to keep the conversation moving, moving on to the next question rather than let the candidates filibuster. 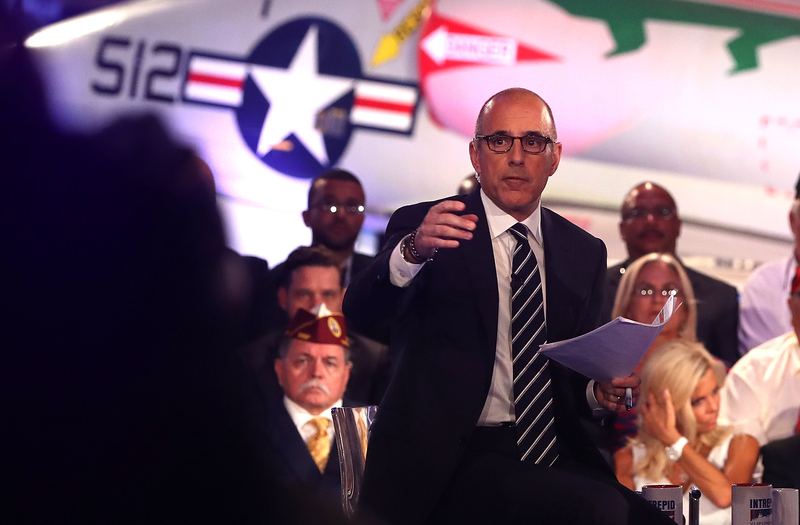 But in speeding through the questions, Lauer neutered the most important parts of the forum. A questioner in the audience asked Clinton about her plans to defeat ISIS, and before she had a chance to begin talking, Lauer told her to answer "as briefly as you can," and cut her off as she went into detail. The most important question had to be cut short, but meanwhile, Lauer spent the first 10 minutes asking questions about Clinton's emails that had been asked a dozen or more times before without adding anything new. Even worse, Lauer quickly moved past one of Trump's most oft-repeated lies — that he had been loudly against the Iraq war before we entered. Trump doubled down on this claim, saying "you can look at Esquire magazine from ’04" (which was more than a year after we invaded Iraq), but Lauer just let it go. Considering how effectively NBC-affiliated programs and reporters have previously called Trump out on this, Lauer should have been better prepared. Media and politics types were not kind to Lauer. The hashtag, #LaueringTheBar began trending. Lauer was in a tough situation. But other journalists have done impressive things with time constraints. Jake Tapper had just nine minutes with Donald Trump, when he needled Trump on his endorsement from David Duke. And Chris Wallace used just over 20 to get an untruthful answer from Clinton about her emails that hounded her for days. But Lauer proved to be less prepared than either of those interviewers. In his piece critiquing Lauer's interview efforts, New York Times television critic James Poniewozik may have summed Lauer's problem up the best: "The host of NBC’s morning show interviewed the former star of its reality show The Apprentice, and the whole thing played out as farce."